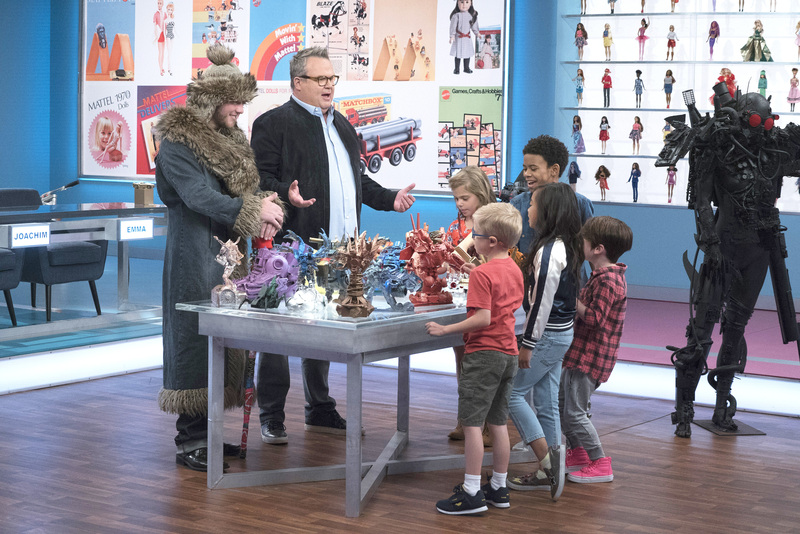 "The Toy Box" is the ultimate toy-competition series, providing talented designers with the chance of a lifetime – an opportunity to bring their toy concept to life with industry-giant Mattel and to the shelves of Toys"R"Us® the day after the season finale. Hosted by Eric Stonestreet ("Modern Family"), inventors present a wide variety of games, plushes and educational, creative and imagination-building toys to the toughest panel of judges – a rotating roster of no-nonsense, toy-loving kids. In each episode, passionate inventors who have poured their hearts and souls into their product present their toy concepts to a panel of the toughest judges in the industry – kids! The judges have the opportunity to play with the toy, give their feedback and determine who will move on to the next round. The winner from each episode will move on to the finale to compete for the grand prize: the inventor's toy will be made by Mattel, sold exclusively at Toys"R"Us stores nationwide and Toysrus.com, joining last season's winner, ArtSplash; and will receive a cash prize of $100,000. In season two, premiering Sunday, October 1, 7|6c, there will be a rotating panel of five kid judges per episode, featuring all new faces and perspectives, and one returning favorite, Noah Ritter (age 8). The judges also include Adi Ash (age 10), Paxton Booth (age 7), Sydney Mae Estrella (age 9), Kyle Lee (age 7), Joachim Powell (age 11), Gideon Reynolds (age 6), Emma Sobel (age 9), Madison Stevens (age 8) and Olivia Trujillo (age 12). "The Toy Box" is from Mattel, Hudsun Media and Electus. Michael Rourke, Chris Grant, Drew Buckley, Richard Dickson, Catherine Balsam-Schwaber, Julia Pistor, Susan House and Hamilton South are executive producers. "The Toy Box" is broadcast in 720 Progressive (720P), ABC's selected HDTV format with a 5.1 channel surround sound.